There are songwriters, and then there are poets — artists who magically weave melodies and words into three-and-a-half-minute masterpieces that outshine the paint-by-numbers songs that often clog up the airwaves. Dean Dillon is the latter. The Tennessee native hitchhiked to Nashville intent on carving his niche in country music and wound up being one of the most successful songwriters to ever set foot in Music City. Dillon’s earliest break came when, at the age of 15, he won a contest that landed him a regular spot on Jim Clayton’s Star Time Variety Show in Knoxville, TN. The singer/songwriter finished high school, and eleven days later, struck out for the bright lights of Nashville. The rest is history. 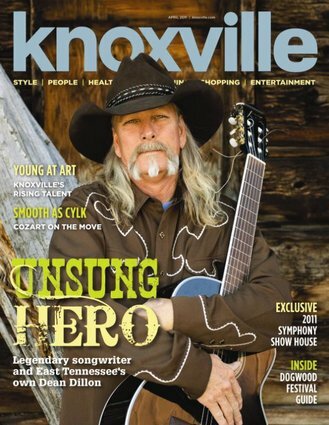 Dean Dillon will be the feature story in the April 1, 2011 Arts & Entertainment edition of Knoxville Magazine. Unsung Hero: Legendary Songwriter and East Tennessee’s own Dean Dillon is an introspective look at the man behind the lyrics.